Midi skirts are definitely all the rage at the moment, but I thought there was something a bit different about this Primark beauty when I saw it. The gorgeous fuchsia gingham print is THE perfect summer pattern and along with being beautifully flattering and lightweight, it is a great skirt for the whopping price of roughly £12. I can't say I have ever been the biggest Primark fan, but that being said there are no "good" ones anywhere close by to me. However, I have found a number of things from there that I have loved recently, and after seeing the spotty pastel heels I posted on my Instagram a couple of weeks ago (albeit I am still trying to find them) I think they have gained a new fan. 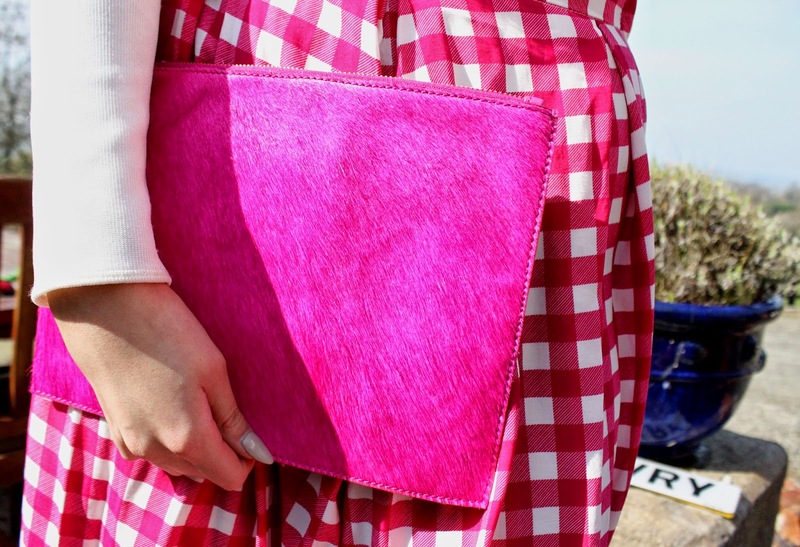 I'm also sporting my favourite ASOS pony fur clutch bag that I got last year. Fuchsia pink is fast becoming my new go to colour! And I'm a sucker for pony fur, so it's just perfect for me. Unfortunately, this is sold out, but ASOS have another really similar one online at the moment, I have added the link for you guys in the info under my images. This outfit is gorgeous - I'm in love with that clutch!